Now that Windows 8 and Visual Studio are in RTM I wanted to put together a quick entry for those Windows Phone developers making the transition to Windows 8 development with their MVVM Light skills. You must have Windows 8 and Visual Studio 2012 installed in order to use the tools mentioned and complete the walkthrough here. Laurent Bugnion, is the creator of the MVVM Light toolkit and I, as well as many others, have been using this for Windows Phone development for a while now. I am porting on of my applications to Windows 8 and wanted to take the knowledge of this toolkit to the new platform hoping that there were either some new enhancements and/or not many changes so that I could just go. Well that was the deal. 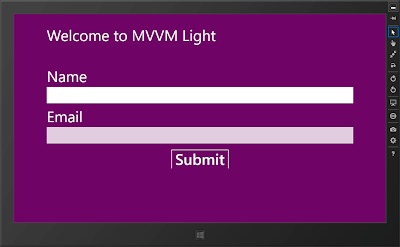 MVVM Light for Windows 8 is a side-by-side install with the standard MVVM Light V3 or V4 beta. Simply download and run the MSI from Codeplex. As usual, the last step of the installation performs a “/setup” of Visual Studio to actualize the project template cache, and unfortunately this last step can last very long. Please be patient and don’t cancel before the end! The installation process is very similar to that described on the MVVM Light installation page (except that there is no NuGet installer for VS11 yet). ObservableObject including all ways to raise PropertyChanged. ViewModelBase including all ways to raise PropertyChanged. Messenger including all message types except DialogMessage (see below). RelayCommand with and without parameter. SimpleIoc which might well be the very first IOC container working on Windows 8. Man do I love the SimpleIoc! Makes adding the new views soooo much easier than in the Windows Phone version. There are a few missing components, one of which is EventToCommand, however thanks to a new friend I have made, Joost van Schaik (see his blog here), there is a solution to that and it's available as a nuget package with some additional behavior features I encourage you to look into but I'll at least cover the EventToCommand features he offers. Name the project "MvvmLight_Walkthrough" and click Ok. The project template is simple, but add some new features that were not in previous versions of the toolkit. In the Solution Explorer you'll notice a Design folder with a class called DesignDataService. This is a great feature; the default template putting in a design data class repository. Second, as in the past version of the toolkit there is the normal ViewModelLocator class, but in this version there is new feature - SimpleIoc, a container class which if you are like me had everything else in a container for DI with the exception of the ViewModels unless you rolled your own. /// Gets the Main property. /// Cleans up all the resources. And last, in the Model folder, Laurent has been kind enough to also include an IDataService interface and DataService class to show in the example how to use the real time and design time data models. These are all wired up in the ViewModelLocator as shown above. Now if we simply run the application you should get the following to make sure it's all good to go! /// The <see cref="WelcomeTitle" /> property's name. /// Gets the WelcomeTitle property. The other nice benefit here is that the template has also put in the wiring for injecting the IDataService into the constructor for the ViewModel. Some of these little thing we developers either take for granted that someone has gone through the trouble of putting the plumbing in there or call it the boring work that has to be done before we get the real work done. You can easily put other dependencies in the constructor here and then just add the mappings in the constructor of the ViewModelLocator by simply registering the types with the SimpleIoc container. A simple example here is to add some content to the MainPage and see how we navigate to a second view. I won't bore you with the details of adding in the controls to the page but here's what the page should look like when you're done. Now let's just add a prompt to the submit button. But wait, what where's my EventToCommand??? Sure with the button there is a Command property and you can set that to an ICommand in the ViewModel and everything is happy. But, there are plenty of controls, both baked into WinRT and third party controls that do not have that property. So, for simplicity sake I'm using this control and will get the EventToCommand back in your toolbox, or your Joostbox I should say. I had this issue where I was looking for the behaviors when porting an app I was working on and could find the dang behaviors in Blend so I went to nuget and did some searching and there wasn't anything that was shaking my fancy. Then I came across Joost van Schaik (see his blog here) and his WinRTBehaviors library and just so happens I hit him in the middle of uploading the nuget package for Win8nl. Now this is a package of Behaviors that was originally a Windows Phone 7 library and It's now growing in its own direction and now contains some Windows 8 specific stuff (according to nuget). So let's get it installed real quick. Install the package by typing the following into the Nuget Package Manager Console or searching for Win8nl in the package explorer. It will add the library and the necessary dependencies to the project, which include WinRTBehaviors. For more information on the other behaviors there check out Joost's blog. Now, open the MainViewModel.cs code and we can add the command for the new behavior here when the button is tapped. As usual the Command property is expecting an ICommand, add the following code to the MainViewModel and return a new instance of RelayCommand to execute whatever behavior you wish. In this example, I'm just doing a little popup to show whatever the user input into the myName TextBox. And that is EventToCommand for MVVMlight for Windows 8! There are many more behaviors in the WinRTBehaviors library that you should take advantage of, for me the most notable ones being FlipViewPanoramaBehavior and NavigationService being ported to Windows 8. 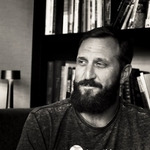 I work on Azure, ASP.NET Core content and Open Source, speak at national and community events while helping teams architect web and cloud applications. Does the nuget package for event to command passes the WACK test. // Place the SettingsFlyout inside our Popup window. It's worth to note that using the built in Command & CommandParameter properties on the Button DO WORK as expected. Only when I try to add the above xaml to the button does it lock up. I'll be using that for now, as I only need the default Click/Tapped events. However thought I'd let you know. Can you post your code for me to see, or a link to an example of it so I can replicate? This is my Application Bar... I'm using a user control to keep the app bar consistent..nothing special, just a grid with stack panels and buttons. And that's pretty much it. Crashes when you try to navigate to the page (or start the app if it's your landing page). Ok Looking into it, might need a new release of the win8nl library. Keep in mind that the appbar in Windows Phone didn't support binding and there were some work arounds that were needed. Let me look into this. And I have another question, in the MVVM light version of EventToCommand behaviour there was an option to pass the EventArgs as the Command Parameter, have you any plans of implementing this? I've been checking this out, but unfortunately the behavior tries to find a RoutedEvent, whereas "Closed" is a 'normal' Event. This is not going to work in this version. I am sorry. I will ponder over possible other scenarios. you show us how to implement metro style like win8. if i choose metro style project template then what will happen when i will run my apps on win 7. the same win8 like UI will be shown on win7. please shade some light. You must have Windows 8 and Visual Studio 2012 installed in order to develop Windows 8 applications. Apologies for not specifying that as a pre-requisite. thanks for reply but one thing i need to know that suppose i have developed apps using metro style on win8 but if i run that apps on win7 then metro style appearance will come. if not then what will be the advantage. "Metro" styled apps or now called Modern UI apps will only run on Windows 8. If you are looking to develop applications that will run on Win 7 and Win 8, look at WPF Desktop applications. 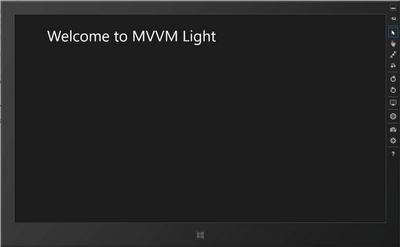 MVVM Light does support Silverlight, WPF, Windows Phone and Windows 8 platform development. Windows 8 has a Desktop mode available in the Professional and Enterprise versions, WinRT does not.